For company owner David Brailsford, Garrick is much more than a nostalgic tribute to times past, but an authentic and heart-felt undertaking to rekindle a tradition of English watchmaking and a legacy which has dwindled to a barely warm ember, with only true Masters like the late, great George Daniels and his world renowned protégé Roger W. Smith upholding the values of a rare craft, and following in the footprints of men such as Mudge, Tompion, Graham and Harrison, who centuries ago were among the pioneering forefathers of horology, and whose inventions and innovations have remained fundamental to the principles of modern watchmaking. In so far as is currently humanly and technically possible, Brailsford has striven to manufacture as much of his watches in Britain, with all finishing and assembling carried out in house. 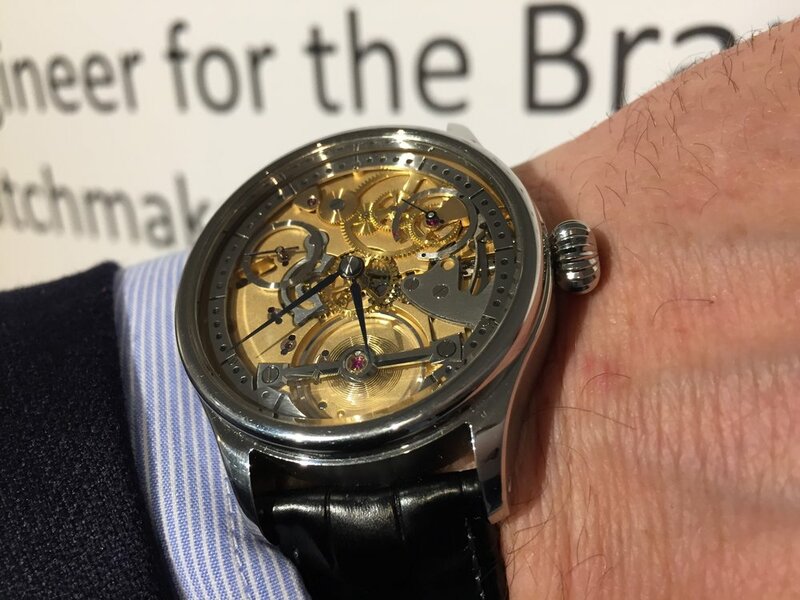 Although he is at pains to stress that his company is not seen as, nor considered to be the next Smith or Daniels, he is still very possessive about what the words "English" and "watchmaking" really mean, and so he does put Garrick in a niche of one, and that's as an English watch brand employing homegrown talent and in house manufacturing using traditional hands-on techniques, which produces pieces which are classical, and evocative of the old world of English watchmaking. Encased in a 42mm round of polished stainless steel, the Garrick S1 has flat sides which flow into the curved ends of the lugs and a big, deeply fluted onion crown calls to mind that of an old pocket watch. The dial is fully skeletonised to maximise the view of the exposed movement, with only a narrow brushed steel chapter ring, punctuated with black drilled minute dots, and a pair of outlined subdials for the small seconds at the ten and power reserve indicator at the two. Flame blued hands are long and taper to fine points, and contrast effectively against a backdrop of gold and steel, although I prefer the marine chronometer inspired style with anchor tail ends (below), which is a Garrick signature and another option. The emphasis of the S1 is on the movement, which with assistance and input from concept horologers UhrTeil AG has been almost exclusively created in Garrick's UK atelier by its own Master Watchmaker Craig Baird. Beneath a steel bridge, the great big free sprung Trinity balance wheel is calibrated only by the fine tuning of the balancing screws and the precise length and coiling of the hairspring, and as the escapement assembly is positioned underneath and out of sight, it oscillates in isolation at 21'600 vph. The surface of mainplate has been given a hand frosted finish and then gold plated, as have the overlying gear wheels, with silvery steel internals contributing to the detailing and contrast, with even the little gold chatons locked into position with tiny blued screws. Underneath, through the sapphire caseback, there is the unusual sight of the escapement ticking alone. Like the front, the movement plate is frosted gold, with only the winding gearing and new Garrick ratchet in stainless steel. There are more of the screw fixed chatons, but otherwise, with the functional, unfussy and elegant architecture similar in appearance to early movements, the influence of the English masters is even more evident. If ever the much clichéd word 'passionate' was more apt, with his personal mission to reawaken a nation to a once famed, but now long dormant craft, by honouring noble traditions and maintaining a connection to an illustrious ancestry, then David Brailsford would sum it up perfectly. The Garrick S1 will be produced in a very limited run of ten pieces, with bespoke customisation welcomed, so it will be unlikely if any two will be identical.